The Thunderbolt-class Strike Cruiser is a Blacktron Alliance fleet battlecruiser based on the Fury-class Heavy Cruiser but armed with a supermassive hyperrelativistic railgun. 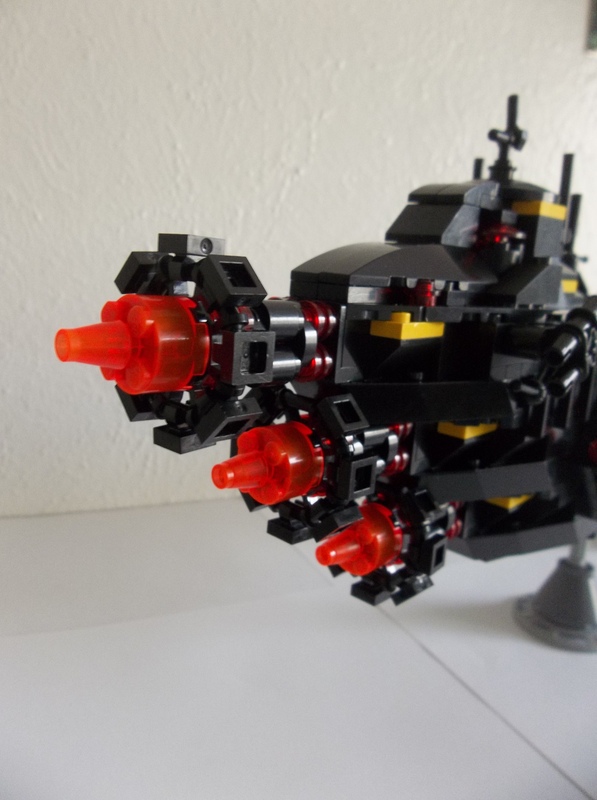 The Fury-class is considered by many observers to be one of the most versatile of Blacktron warships due to the several variants it has spawned, including not only the Thunderbolt-class but also a Marine assault variant (the Nemesis-class) and an extensively modified hospital ship (the Hippocrates-class). The base Fury-class are armed with a pair of triple-mounted 50cm high X-ray laser turrets dorsally and three ventrally, plus six side-mounted sponsons with three 25cm lasers apiece, with frequencies in the low X-ray/high UV range. For close assault, the baseline Fury utilises a trio of heavy 60cm plasma accelerators mounted forward, plus various lighter 10cm point defence laser clusters. Bow end of the Thunderbolt, showing the supermassive railgun and twin dorsal plasma accelerators. The Thunderbolt-class modifies the baseline Fury by dispensing with all three ventral 50cm X-ray laser turrets plus one of the plasma accelerators and rerouting power to the hyperrelativistic railgun. The 10cm laser point defence clusters are upgraded to 12cm mounts with a faster cooling cycle between shots, given how Thunderbolts draw enemy fire. The three quantum-gravitic antimatter engines are unchanged from the baseline Fury-class. The Galactic Federation believe that quantum gravity engines are too dangerous and unstable for normal use, so they utilise the slower linear induction drives for normal-space manoeuvring and hyperspace jump engines for interstellar transit. Quantum gravity engines generate a wormhole-like gravitational singularity which at lower power settings acts to propel the ship forwards sliding down an inclined plane of spacetime, and at higher power settings creates a full-scale directed temporary wormhole allowing point-to-point space jumps. The technology releases a certain amount of dangerous cosmic radiation, however, especially at the high-power spatial jump settings. The Federation considers the Thunderbolt-class to be a terror weapon because of the destructive power of its EL-3(T) railgun. Nicknamed the “Elephant Gun”, it fires a 12.5-tonne nickel-iron-banded titanium cylinder to velocities approaching 85% of lightspeed. At that velocity, the kinetic energy of the projectile is well into the dinosaur-kilker range, and unconfirmed rumours exist of 2000km diameter planetoids actually being broken apart by Elephant Gun strikes. The Blacktron Alliance consider the Thunderbolt-class a deterrent against ongoing Federation encroachment on its sphere of influence as agreed in the 2247 Treaty of Achernar. The politics of Federation-Blacktron interstellar relations are murky at best, and the Treaty of Achernar is only one of a string of “binding treaties” broken or abrogated by one side or the other. 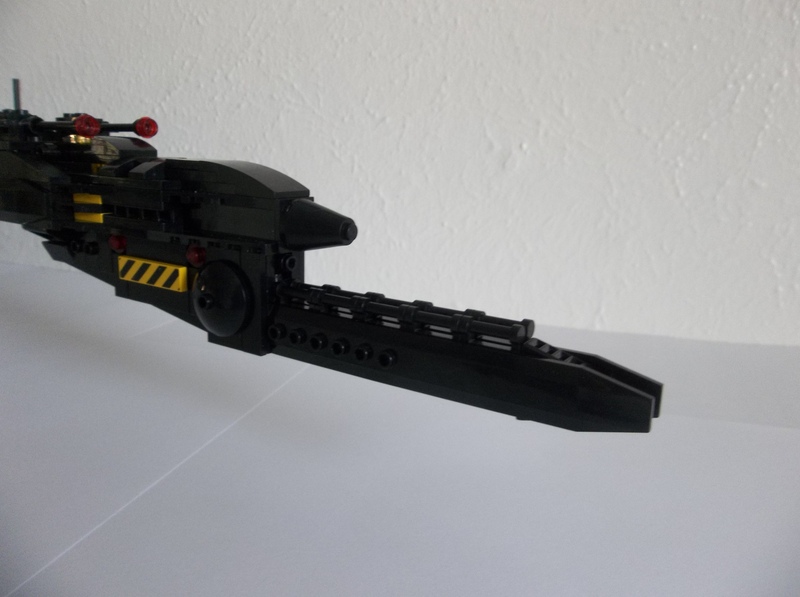 At 28 inches long (71cm, or 75 studs), this is my largest Blacktron construction to date. I was actually shocked that it ended up so much longer than my spacewhale, but that’s what the tape measure says. It’s a smaller volume ship, obviously, but yes, it’s a full 11 studs longer than the Cetus. It’s also a lot more conventional in construction, without the internal Technic framing, multidirectional structural (rather than decorative) SNOTwork and clever technique. I rather like it anyway, but it’s just a lot less clever. 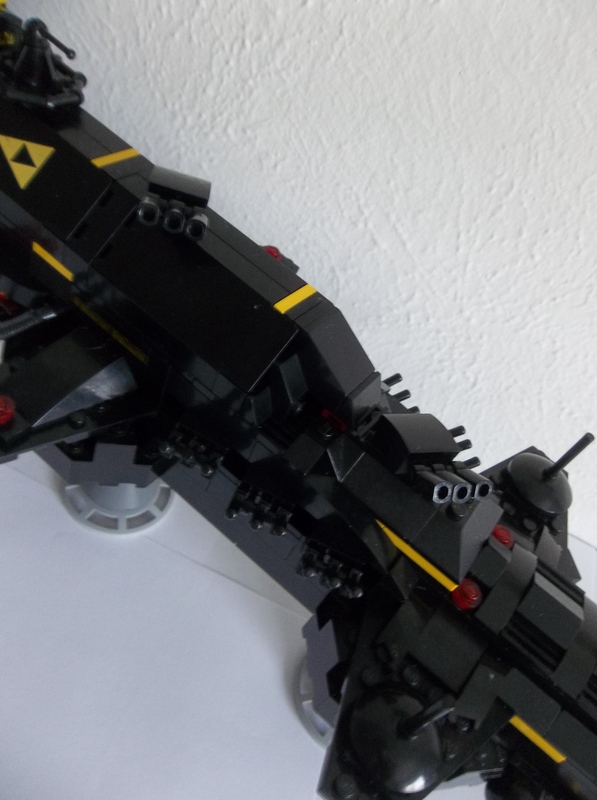 This entry was posted in Blacktron, Lego Space and tagged Lego, LEGO Blacktron, Microscale, MOC on September 9, 2017 by geoffhorswood.